Indians have always loved to move to Australia and Canada to find an overseas job. At present, Australia has decided to give a priority to the local residents and has introduced rigid visa norms for Top skilled foreign workers. Many Indians, who submit an application for a work visa, are hired by using the subclass 457 visa category, but those days are over now. In its place, the government in Australia has introduced the Temporary Skill Shortage visa from March 18. This makes it difficult to get Permanent Residency or an admission to a university. The vacancies for overseas jobs will decline because the government has ordered that the companies who sponsor them must contribute 1,200 Australian dollars to an Australian Skilling Fund for each employee annually. The Temporary Skill Shortage visa makes possible to attract overseas workers in temporary skill shortages but ensures that local workers get a priority. The TSS visa holders are eligible to work in the country in a specific occupation, for an approved sponsor, under the short or medium-term, and also in the labor agreement stream. For the short-term stream, employers sponsor an aspirant temporarily in jobs that are listed on the Short-Term Skilled Occupation List for just two years (four years in case an International Trade Obligation is involved). The government has greatly reduced nearly 200 occupations in the list for the two-year stream. For the medium-term stream, employers sponsor an aspirant in the foreign skilled worker category for four years in such occupations that are listed on the Medium and Long-term Strategic Skills List. For the long-term stream, employers sponsor aspirants only when they enter into a labor agreement signed by the Home Department. This two-year visa program does not help to get the PR automatically, but the candidates figuring on the medium-term visa are eligible to get PR to Australia after a three-year gap. The migration reforms had begun months ago. In January 2018, a list of skilled migration visas was issued where the occupations were pruned off and a reshuffle of skill categories was done. There is likely to be another list in the future. The reason for these reforms is to ensure that locals receive an equal opportunity. As per the Home Department of Australia, there was an announcement in April 2017 mentioning the fact that 457 visas would be abolished as there were concerns to the effect that locals were not given a priority in skilled jobs. Alan Tudge, Minister for Citizenship stated that the changes were meant for strengthening visa arrangements for ensuring that local workers were given a priority in skilled jobs in Australia. He went on to say that The Government has delivered on the promise to have the right balance between protection of local jobs and support to the employers to fill up vital skills shortage. 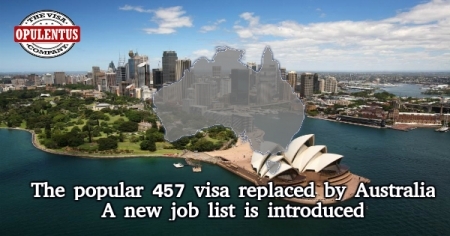 Indian professionals were on top of the list to get hired using the 457 Visa category. As per the available figures 90,033 visa card holders, 19,400 people or 21.6 percent were Indians. The share of the UK was 16,800 visa holders or 18.7 percent. The government will regularly review the occupation lists, and the Department of Small Business and Jobs will start a consultation process, on skills shortages found in regional areas. The result of this process will be a factor in the review of July 2018.